Special Update: Carey & Hanna | Tax & Wealth Planners would like to express our appreciation to those who voted in The Ventura County Star's 2018 Winner's and Favorite's edition. 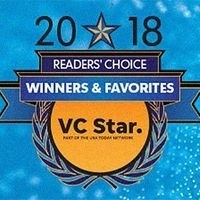 For the past 7 years, we are a Ventura County Star Reader's Choice Winner! We will continue our legacy of quality, reliability, and convenience. Thank you to our Ventura family and friends! Financial Planning Favorite Source: Ventura County Star. Voted Financial Planning Favorite (May 2018). This award is based upon public voting through Ventura County Star. As such, the award is not representative of the Financial Advisors future performance. Neither (Davin Carey nor HD Vest Investment Services nor HD Vest Advisory Services) paid a fee to Ventura County Star in exchange for the rating.